Batcave Toy Room - Better Living Through Toy Collecting: Whatever Happened to Superman Peanut Butter? 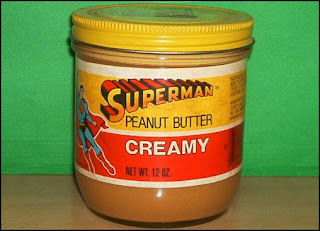 Whatever Happened to Superman Peanut Butter? I don't think my parents ever bought Superman peanut butter, but I do remember the commercials. If its strength was its great taste, what ever happened too it? Maybe Lex Luthor exposed it to Kryptonite. Anyone ever eat Superman peanut butter? I remember how easily sold I was on stuff as a kid. Slap Batman or Superman on the sticker and I wanted it. I hear you. Marketers can save a ton of money with me by just putting a Baman logo on everything..